I really like how she demonstrated that using just two colors for this block turned out a really interesting result as well. 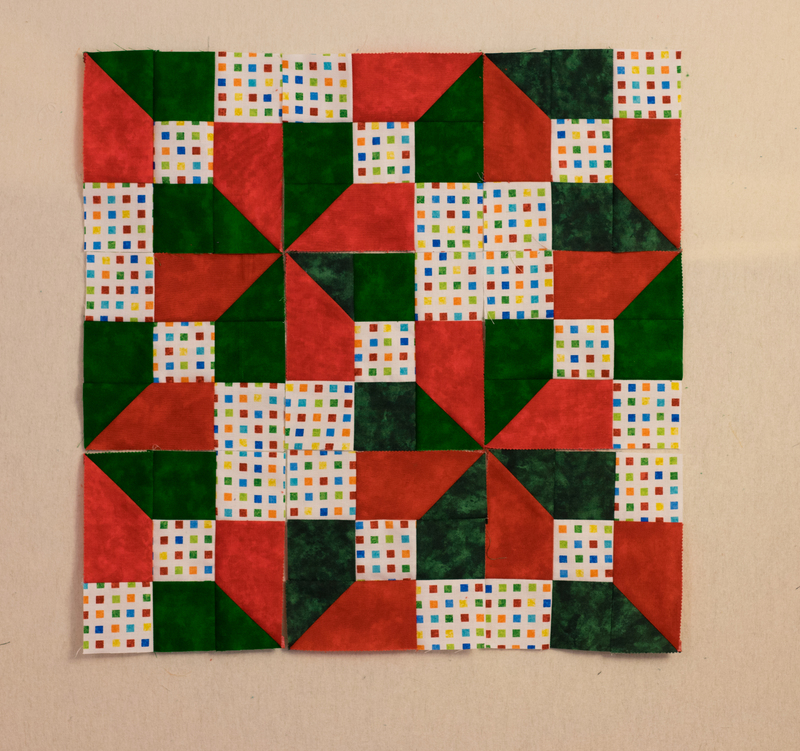 So of course now I need to actually make a quilt and not just a block! So that’s on my to-do list to start this weekend. But…I also have another technique I want to try so we’ll see which gets accomplished first, LOL. Again, I would love to see what anyone else comes up with when playing with this technique. Folks who would like to send me pictures can e-mail them to beyondsockmonkeys@gmail.com. It is such a pleasure to see others creations! This entry was posted in Projects and tagged nine patch quilt, quilt block, stained glass, two color quilt on April 18, 2014 by denmck. Engineer, mathematician, or free spirit – which path do you take when designing quilts? 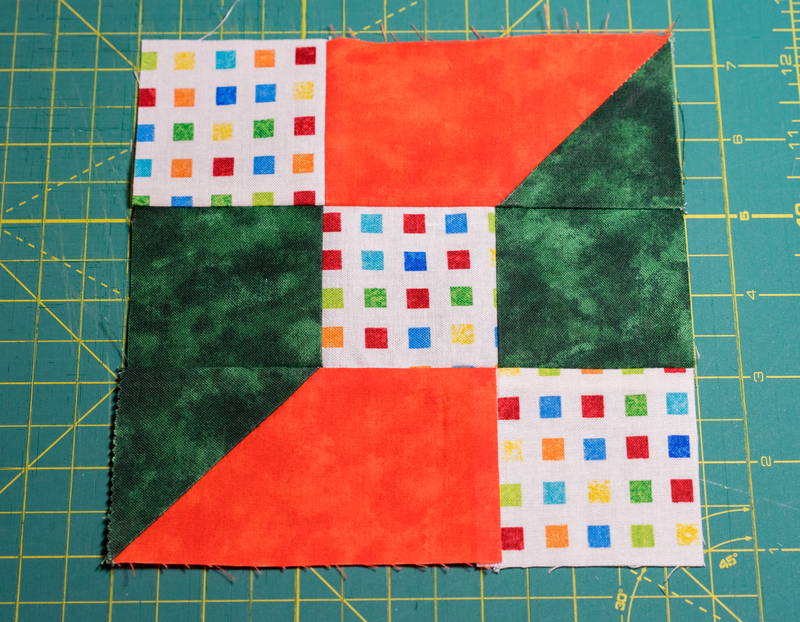 I don’t know why I have these unexpected, sudden moments of clarity, but once again, I realized there was another way to make my “accidental” quilt block. I’m going to need to find another name for it eventually! 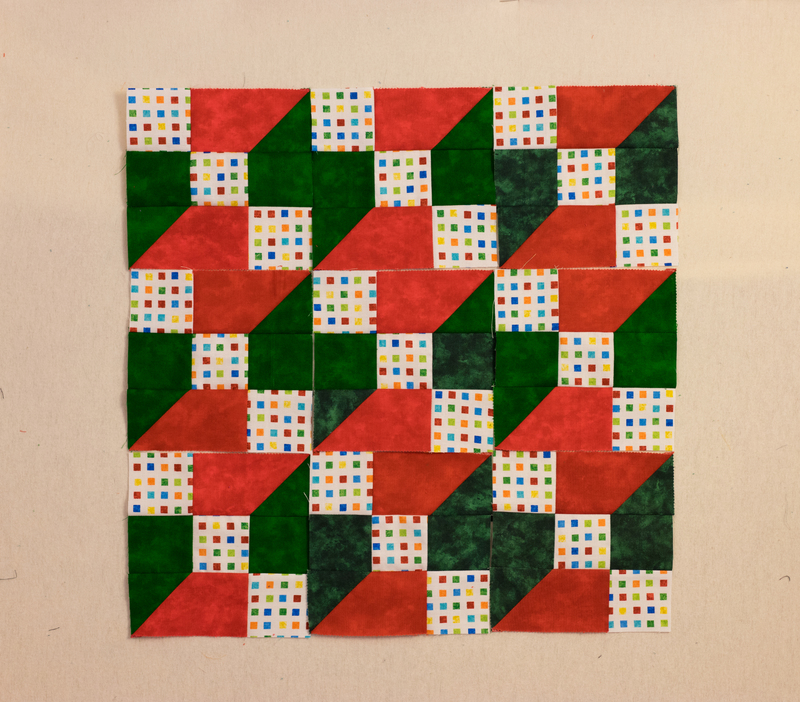 While playing with ideas for another round of borders on my Laurel Burch quilt, I had cut some small squares and made some half square triangles. As they were laying on my cutting table suddenly I saw it; another way to make that block! So this got me thinking. If I was better at geometry, or knew a little something about engineering, would I have been more prone to have figured this out sooner rather than by accident as I was experimenting? That said, if I was just a more experienced quilter would I have known this as well, LOL. There was actually a time in my life where I would have been mad at myself about this. My internal dialogue would have been “How dumb of me to think I discovered a way to make a unique block” (when I was playing with the sub-cutting of a nine patch). I would have felt foolish. But for some reason, maybe because I’m more “mature”, I just felt like this was a new lesson learned and still enjoyed the process of experimenting without trying to adhere to specific standards. However, for me, this third technique is really easier than trying to design a color layout for the nine patch that will give me the right result after cutting it up then sewing the pieces together. In this one the red and green cross really stands out to me. So my quilting education continues! Whether I try to think like an engineer, mathematician, or blindly go my own way, I’ll just enjoy the process! This entry was posted in Projects and tagged flower quilt, geometric quilt, quilt block, quilt experiment, zig zag quilt on March 16, 2014 by denmck.